Think of branding, marketing, and customer engagement, and the only platform that you would look upon is a social media platform. Right? Among the availability of several social media platforms round the corner, one of the popular social media platforms that is being used by millions of people is a twitter. Are you looking forward to promote your brand on this popular social media landscape? Great! The platform can help you grow your brand in an efficient way. But, do you have any specific plan of action to achieve your goals? The blog explores some of the tactics that you must apply while using twitter as your social media marketing platform. At the end, all you need is to engage potential customers in order to grow your business. Right? So, how can you use twitter to get engaged with several prospective customers? Well, you can do so efficiently by being an active member on twitter. Yes! Follow people whom you find interesting with regards to your business. Like their tweets, respond to them, and retweet them if you find it interesting. Wondering why you need to do so to enhance tour business? Remember, people will respond and acknowledge your tweets only if you listen to them and acknowledge them. That being said, the more you take part in other people’s tweets, the more you will get the response, thus engaging with more and more people. Moreover, you must get involved with the weekly chats that you find relevant for your brand. Have you been using hashtags in your content? Make sure to use it properly in order to draw the attention of potential customers. When it comes to content, you must know that twitter allows you to include 140 characters only. So, all you need to do is influence people with your creative content. Prepare a content strategy and be aware of your goals and your audience. Show the power of your words, and tweet interesting articles by incorporating your thoughts wisely. Are you aware of inline images feature in twitter? Well, the feature, introduced in 2013, allows you to directly scroll through the images without clicking any link to view the image. Being an essential part of brand building, you must make sure to tweet with inline images every time. Just implement it and get ready to receive more retweets, more clicks, and more favorites. The most significant part that you must consider is the proper organization of your twitter account. Are you spending number of hours at twitter and still not getting any response? This might be the result of poor organization. Yes! You must begin by analyzing the prime time which can be decided according to the location of your audience. That being said, determine the optimal time, schedule your tweets, and get positive results without the need of over posting your tweets again and again. Once you start getting the desired response on twitter, you need to maintain consistency to keep your twitter presence unique. You must maintain your brand’s tone to keep your audience engaged with your brand. Moreover, you need to remain active on twitter for same time period as before. Or else, you will end up with less customer engagement comparatively. 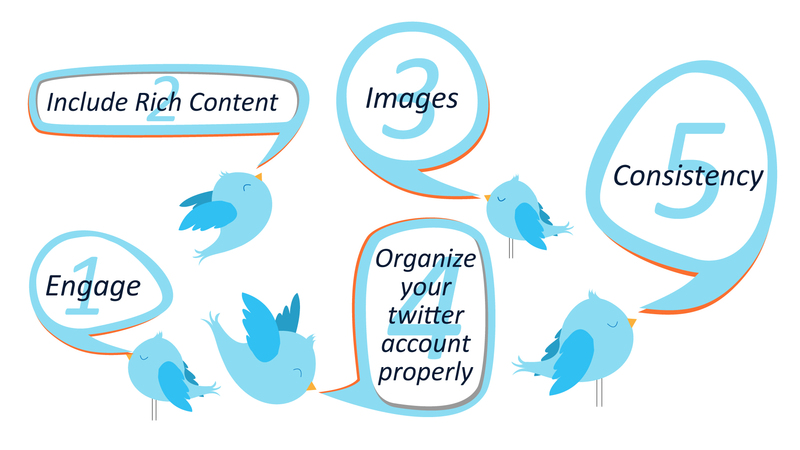 Keeping in mind the above tactics would help you maintain your presence on twitter in an efficient way. Experts at Mamsys tend to keep track of new trends, thus allowing you to establish a strong presence of your brand on twitter.